Start the game by placing Infantry pieces. Later, you can trade in 5 Infantry for 1 Cavalry, or 2 Cavalry (or 1 Cavalry and 5 Infantry) for 1 Artillery. 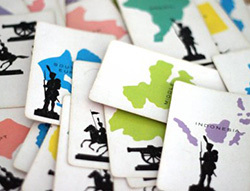 42 Cards are marked with a territory and a picture of Infantry, Cavalry, or Artillery. Two "wild" cards marked with all three pictures, but no territory. 12 Secret Mission cards used only in Secret Mission Risk. These cards are only used in the secret mission variation, else you have to remove them. To conquer the world by occupying all territories on the board. You need to eliminate all your opponents. Select a color and, depending on the number of players, count out the "armies" you'll need to start the game. If 2 are playing, see special instructions. If 3 are playing, each player counts out 35 Infantry. If 4 are playing, each player counts out 30 Infantry. If 5 are playing, each player counts out 25 Infantry. If 6 are playing, each player counts out 20 Infantry. Roll one die. Whoever rolls the highest number takes one Infantry piece from his or her pile and places it onto any territory on the board, thus claiming that territory. Starting to the left of the first player, in turn, everyone places one army onto any unoccupied territory. Continue until all 42 territories have been claimed. After all 42 territories are claimed, each player in turn places one additional army onto any territory he or she already occupies. Continue in this way until everyone has run out of armies. There is no limit to the number of armies you may place onto a single territory. 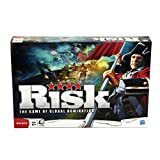 Shuffle the pack of RISK cards (maybe, remove the Mission cards) and place the cards face down by the side of the board. This pack forms the draw pile. Whoever placed the first army opens the game. On your turn, try to capture territories by defeating your opponents' armies. But be careful: Winning battles will depend on careful planning, quick decisions, and bold moves. You will have to place your forces wisely, attack at just the right time and fortify your defenses against all enemies. Note: At any time during the game, you may trade in Infantry pieces for the equivalent in Cavalry or Artillery if you need to, or wish to. Getting and placing new armies. The number of territories you occupy. The value of the continents you control. The value of the matched sets of RISK cards you trade in. The specific territory pictured on a traded-in card. At the beginning of every turn (including your first), count the number of territories you currently occupy, then divide the total by three (ignore any fraction). The answer is the number of armies you receive. Place the new armies on any territory you already occupy. Example: 11 territories = 3 armies, 14 territories = 4 armies, 17 territories = 5 armies. You will always receive at least 3 armies on a turn, even if you occupy fewer than 9 territories. In addition, at the beginning of your turn, you will receive armies for each continent you control. (To control a continent, you must occupy all its territories at the start of your turn). These numbers can be different depending on the version of Risk you are playing. To find the exact number of armies, look at the chart in the lower left-hand corner of the game board. 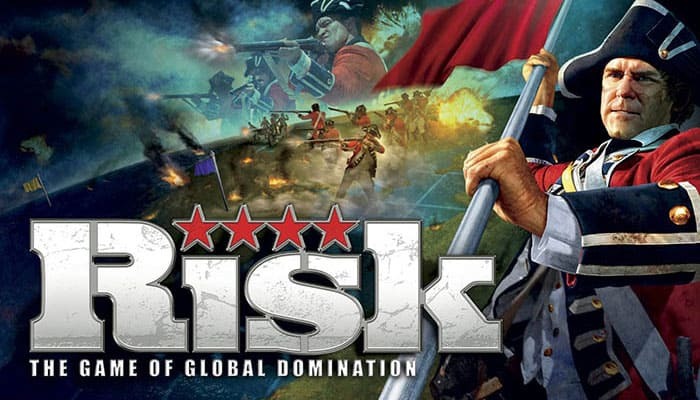 At the end of any turn in which you have captured at least one territory, you will earn one (and only one) RISK card. You are trying to collect sets of 3 cards in any of the following combinations: 3 cards of the same design (Infantry, Cavalry, or Artillery), 1 each of 3 designs, or any 2 plus a "wild" card. 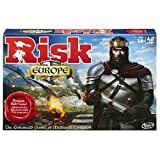 If you have collected a set of 3 RISK cards, you may turn them in at the start of your next turn, or you may wait. But if you have 5 or 6 cards at the beginning of your turn, you must trade in at least one set and may trade in a second set if you have one. At the beginning of subsequent turns, you may trade in matched sets of cards and take additional armies based on the total number of sets anyone has traded in so far. For quick reference, keep traded-in cards face down under the bottom edge of the game board to mark the value (in armies) of the next trade. After the sixth set has been traded in, each additional set is worth 5 more armies. Example: If you trade in the seventh set, you get 20 armies; if you trade in the eighth, you get 25 armies, and so on. "First" and "second" set, etc., refer to sets traded in by anyone during the game. Thus, if you trade in the 3rd set in the game, you receive 8 armies, even if itis the first set you have traded in. Occupied territories: If any of the 3 cards you trade in shows the picture of a territory you occupy, you receive 2 extra armies. You must place both those armies onto that particular territory. Note: On a single turn, you may receive no more than 2 extra armies above and beyond those you receive for the matched sets of cards you trade in. Tip: No matter how many armies you receive at the start of your turn, deploy them carefully-either to prepare for an attack or to defend against one. It is a an excellent military strategy to move your armies to the front, heavily fortifying territories that border enemy territories. 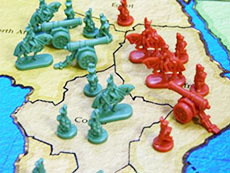 After placing your armies at the beginning of your turn, decide if you wish to attack at this time. The object of an attack is to capture a territory by defeating all the opposing armies already on it. The battle is fought by a roll of the dice. Study the board for a moment. Do you want to attack? You may only attack a territory that's adjacent (touching) to one of your own, or connected to it by a dashed line. Examples: Greenland may attack the Northwest Territory, Ontario, Quebec, and Iceland. North Africa may attack Egypt, Western Europe, and Brazil. At the western and eastern edges of the board, Alaska is considered adjacent to and may attack, Kamchatka. You may continue attacking one territory until you have eliminated all armies on it, or you may shift your attack from one territory to another, attacking each as often as you want and attacking as many territories as you like during one turn. First, announce both the territory you're attacking and the one you are attacking from. Then roll the dice against the opponent who occupies the opposing territory. Before rolling, both you and your opponent must announce the number of dice you intend to roll, and you both must roll at the same time. You, the attacker, will roll 1, 2 or 3 red dice: You must have at least one more army in your territory than the number of dice you roll. Hint: The more dice you roll, the higher your odds of winning. Yet the more dice you roll, the more armies you may lose, or be required to move into a captured territory. The defender will roll either 1 or 2 white dice: To roll 2 dice, he or she must have at least 2 armies on the territory under attack. Hint: The more dice the defender rolls, the higher his or her odds of winning, but the more armies he or she may lose. Compare the highest die each of you rolled. If yours (the attackers) is higher, the defender loses one army from the territory under attack. 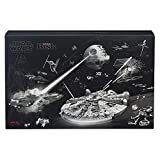 But if the defender's die is higher than yours, you lose one army from the territory you attacked from; put it back in your clear plastic box. If each of you rolled more than one die, now compare the two next-highest dice and repeat the process. No matter what you have done on your turn, you may end your turn by fortifying your position. You are not required to win a battle or even to try an attack to do so. Some players refer to this as the "free move". To fortify your position, move as many armies as you would like from one (and only one) of your territories into one (and only one) of your adjacent territories. Remember to move troops towards borders where they can help in an attack and leave at least one army behind. 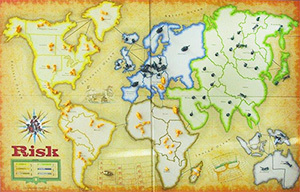 The winner is the first player to eliminate every opponent by capturing all 42 territories on the board.